Washington, D.C. — When Marist polled the American public on the subject of late-term abortion in November 2015, the results were striking. A full 81% of Americans support banning abortion after the first trimester of pregnancy. Even among those who identify themselves as “pro-choice,” two-thirds oppose second and third trimester abortions to the extent that they agree they should be illegal. Clearly, based on the unpopularity of late-term abortions, one might conclude that the number of abortion facilities that conduct these abortion procedures would be very small. However, according to a survey conducted by Operation Rescue in December 2015 through January 2016, the actual number might be surprising. First, however, it is important to clarify terms. A human pregnancy lasts 40 weeks. A baby in the womb is considered to be full-term at 37 weeks. The first trimester of pregnancy extends through the first 12 weeks of gestation. Surgical abortion facilities often classify first trimester abortions as those done through the end of 13 weeks. Surgical abortions within this time frame can be done using a one-day procedure. 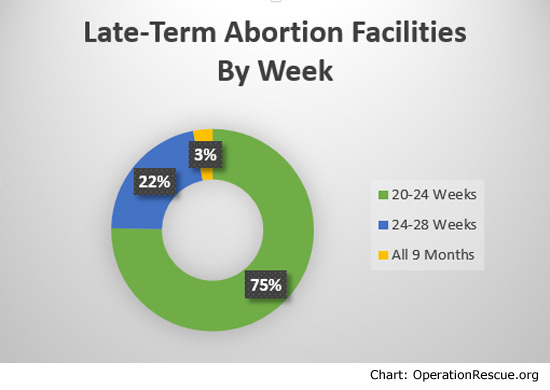 The term “late-term abortion” can refer to all second and third trimester abortions, but since there is currently a Congressional effort to ban abortion after 20 weeks, references here to “late term abortion facilities” will mean those that conduct abortions at 20 weeks of pregnancy and later. 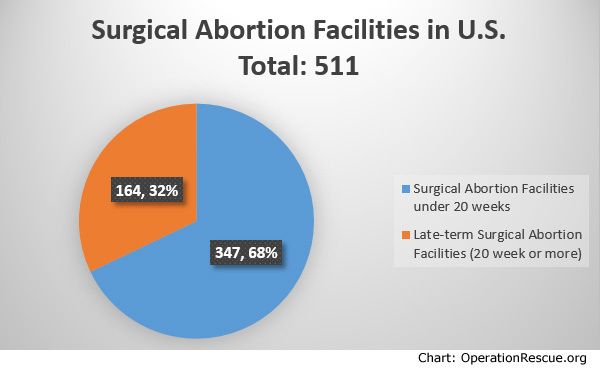 In the United States, as of this writing, there are 511 active surgical abortion facilities. Of those, 162 surgical abortion clinics conduct abortions at 20 weeks gestation or later. Out of the 162 late-term facilities, 122 facilities, about 76%, will not provide abortions after 24 weeks. Despite research that shows viability may occur as early as 22 weeks, abortion businesses consider viability at 24 weeks of pregnancy. There are 40 abortion facilities in America that openly do abortions at 24 weeks or later. It may be surprising to know that the vast majority of abortion facilities that offer abortions at 20 weeks or later are not affiliated with Planned Parenthood. 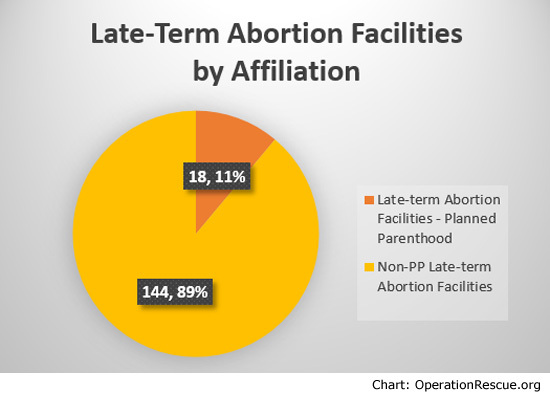 Only 18 out of 162 late-term facilities are Planned Parenthood facilities. The remainder, 144 facilities, are independent or have other affiliations. Since abortion risks to women increase for each week of pregnancy it is important to note that all five of these facilities are not equipped to deal with those consequences, which are all-too frequently life-threatening in nature. Thus, late-term abortions pose a grave public safety risk to women in this country, who often don’t find out until they are on a gurney in the back of an ambulance just how dangerous late-term abortions can be. But the risks only increase when the abortionists operate under the radar – some illegally — quietly doing late-term abortions that are not publicly advertised. Such was the case with Kermit Gosnell, a West Philadelphia abortionist who quietly conducted illegal late-term abortions throughout the evening and into the early morning hours, unbeknownst to the general public, at his “House of Horrors” abortion facility. Gosnell was caught and convicted not only of illegal late-term abortions, but also three counts of first degree murder for “snipping” the necks of babies born alive during late-term abortions. But Gosnell certainly is not the only abortionist to play fast and loose with the legal limits on late-term abortions. Steven Chase Brigham made a practice of committing illegal late-term abortions. He used a bi-state abortion scheme in an attempt to circumvent gestational limits on abortion in his home state of New Jersey. This dangerous behavior cost him medical licenses in New York and later in New Jersey, but that hasn’t stopped New Jersey residents from spotting him at his clinics on abortion days. Is Brigham still conducting abortions illegally? It would not be surprising to find out that he was. Also known for illegal late-term abortions is James Scott Pendergraft IV, who was caught by Operation Rescue operating a bi-state late-term abortion scheme similar to Brigham’s, but with a twist. Pendergraft, who lives in Florida, advertised that he would fly to Maryland where he would oversee the injection of late-term babies with a drug called Digoxin to stop their hearts. He was then willing to send women home while dangerously still carrying their dead babies, which could then be “delivered” at a local hospital of their choice. But what Pendergraft never told his patients was that he was not licensed to practice in Maryland. While the Maryland Board of Physicians broke up Pendergraft’s illegal late-term operation and put his accomplice, Harold O. Alexander, on a short suspension, it didn’t stop Pendergraft or Alexander from conducting late-term abortions illegally. Pendergraft was arrested in October, 2015, in South Carolina – when he is also unlicensed – operating an illegal rolling abortion business out of his vehicle. Authorities discovered drugs and bloody surgical instruments in his possession that were caked with fetal tissue. His criminal case is pending. Meanwhile, Operation Rescue has confirmed that Alexander continues to do late-term abortions through 26 weeks even though the Maryland Board of Physicians filed an Administrative Complaint against him for this illicit practice in July, 2015, and is seeking to revoke his medical license in that state. From this we can conclude that there are an unknown number of abortionists in American who offer late-term abortions in secret and perhaps illegally at great risk to the lives of women and their babies that the laws of our nation should protect. While the public soundly rejects late-term abortions, the number of late-term abortion facilities that openly commit such barbaric procedures certainly does not reflect that sentiment. Worse yet is the fact that the number of known late-term facilities is low compared to what actually transpires in the shadows of the secretive American abortion industry. This problem is a case in point for a Federal ban on late-term abortions, tight abortion restrictions, greater oversight of abortion facilities, and strict enforcement of abortion laws. On Tuesday, March 15, 2016, the U.S. Senate Judiciary Committee is conducting a hearing on entitled “Late-Term Abortion: Protecting Babies Born Alive and Capable of Pain.” That testimony will be of great interest to those of us who work to expose late-term abortion abuses and halt that grisly practice as we move toward the goal of building an abortion-free America. View the live stream beginning at 10:00 a.m. Eastern on March 15 of the Senate Judiciary Committee hearing on late-term abortions. Note: Karen Myers contributed to this report.